When it’s June, 70 degrees, and breezy, I always think of school year summer vacations. You remember those days…waking up when you want, maybe heading to a summer job, reading outside, going out for ice cream and long drives….sigh. I’m a romantic at heart, as you all know. I love the idea of hanging out with your head in the clouds all day…which is probably why I love a whimsical print. This hot air balloon cardigan immediately brought me back to those days. Hanging out on our backyard swing set, watching the hot air balloons float by. 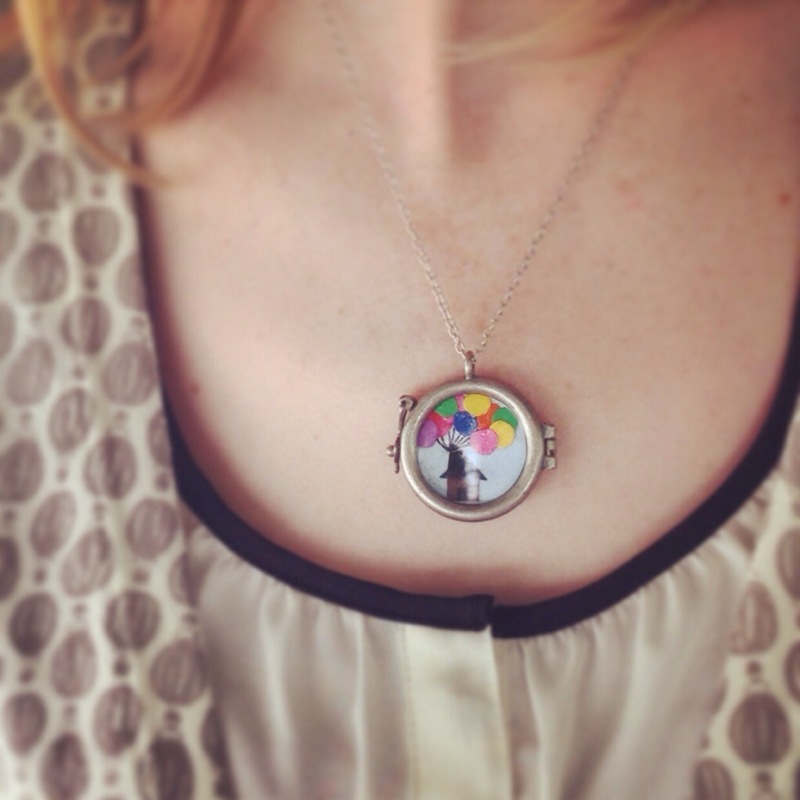 While I was day dreaming, I pulled out my “Up” themed necklace that I made a couple of weeks ago to complete my day dreaming themed look. Why not daydream a little? I may no longer get 3 month long summer vacations…but a girl can dream, right? 1) I generally don’t frequent Target for clothing all that much, but they actually have a pretty good clothing selection there! I usually shop their clearance section, when I do go, though I’ve noticed the clearance section is significantly bigger online than in-stores. Their prices are so-so full price for the quality, in my experience, but the sale prices are quite good. I like their shoe selection, as well, but have found that their shoes don’t really last beyond one season, so keep that in mind. You might be better off looking somewhere like DSW or Nordstrom Rack for around the same prices, but slightly more durable shoes. However, I’m open to feedback on this, if anyone has had other experiences! 2) I’m still a huge pan of the colored pants collection at Gap. Seriously, I may have a problem. I wear their colored pants all year long, and find that you cannot beat the prices. When you shop their sale section, look for pants around $5-$15. You might be surprised how many pairs you find! One thing I’ve noticed there is I’m not the same size in all pant styles, so you may want to try on various styles and sizes before writing off any particular pair you find. Does anyone else have tips for Target shopping? Or have any feedback on their shopping experiences there? Awesome!! That’s great feedback! I agree, wash gently and hang dry, is a good strategy for anything, really! Interesting about the shoes- maybe I need to give them another go?! What a great outfit! I think that one resonates particularly well. There’s a certain ease and comfort in your poses that tells me that it’s one of your warm weather favorites. That’s really interesting- thanks! I feel like I can normally tell when I feel extra comfortable in something because the photos tend to look a little different; apparently I’m not just making that up!! Absolutely love the neck piece! Those shoes!!! I love them!! Crafty huntress! Loving the necklace!! The memory of summer vacations is a great inspiration for an outfit – such fun! Love the necklace! I may just have go and get my own UP necklace. After seeing that movie I made myself and adventure book that summer! I bought the bicycle cardigan at Target, Love it! oh gosh, love how you added whimsy to a look that’s classic and sophisticated with that necklace – so lovely. That’s so funny, because I completely agree! A lot of times, especially in areas where it didn’t seem as appealing to people, all of the designer collab is on the clearance rack- and, of course, then I getting inexplicably excited to get the quirky stuff! I love this outfit , definitely my color , awesome ! Definitely love this outfit, especially shoes!!! How cute is your necklace! Lovin’ the mix of neutrals, great look. I love this ensemble and that top is gor-ge-ous.